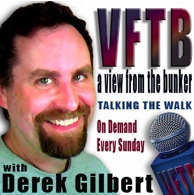 ONE OF THE BEST interviews we’ve had a chance to do was with Derek Gilbert of PID Radio and VIEW FROM THE BUNKER. As has become customary, Derek interviews the speakers at the Future Congress and Prophecy in the News “SUMMITS”. The three co-authors of the Final Babylon were the last interview. Derek and wife Sharon commented afterward that our interviews was perhaps the most lively. Given Doug Krieger’s quiet and laid back ways, it was shocking (kidding of course!) You will enjoy the discussion of course as the best interviews result from a great interviewer, and Derek is certainly that. WHAT ROLE does America play in end times prophecy? Most assume that the United States do not appear in scripture, which leads some to conclude that something happens to take the USA out of the world picture before the events that lead up to the Second Coming. Doug Woodward (www.Faith-Happens.com) and co-authors Doug Krieger and Dene McGriff of The Tribulation Network disagree. They joined us at the Prophecy Summit at Pikes Peak to discuss their new book, The Final Babylon: America and the Coming of Antichrist. They suggest that America is not only mentioned in scripture, it is at the very center of prophecy — and will be the power base of Satan’s conspiracy against the Kingdom of God. This interview is one of about two dozen recorded over the three days of the Prophecy Summit at Pikes Peak, July 26-28, 2013. To see these interviews with all of the presentations from the Prophecy Summit, please visit our friends at Prophecy in the News. Please join the discussion at the PID Radio Cafe, visit the VFTB Facebook page and check out the great Christian podcasters at the Revelations Radio Network. Download a smaller, lower-fidelity version of the mp3 of this show by clicking here.